It's been racehorse hockey for some reason. C.J. 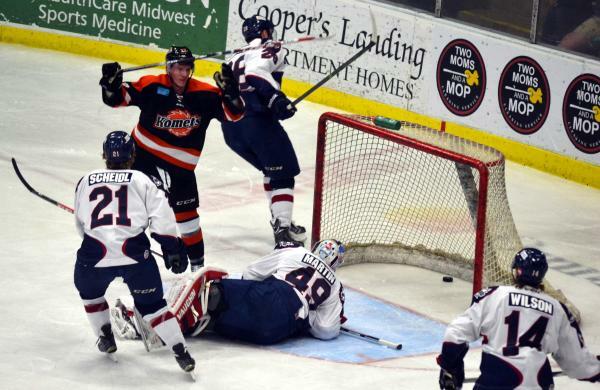 Severyn scored his second of the playoffs for the Komets. This is so frustrating to watch.......our special teams are brutal. The wings are putting more offensive pressure on us even strength than we can muster on our PP. We have the skill and speed edge but they are taking us to school. Where are the adjustments? Where is our pressure? Where is our speed? Don't know how we have the lead......they are dominating us. Where are you Gary?????? Pffff, calm down. Theres 15 other teams in the playoffs with NHL/AHL talent well coached and strategized to the seams wanting to win day in and day out. Komets don't lose bc they choose to nor do the other teams. One loss and everyone loses their mind. You're the reason kids have to wear face masks playing outfield in softball. Go Komets.